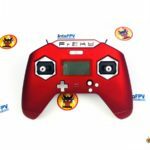 Here is an overview of the Frsky R9M-Lite module, and we will test the latency and see how it compares to the TBS Crossfire. Both are great 900MHz RC systems for long range and many are hesitating which one to get. With latency being one of the main considerations we hope you find the test useful. Here is how you can update firmware on Flysky Nirvana radio transmitter to the latest firmware developed by UndergroundFPV. I shared news about the Nirvana TX back in February, and it’s finally here! I will try to cover as much information I have in this review. During the latency testing on the Frsky X-Lite, we discovered some interesting results. There is delay in the gimbals, (how often the gimbal value is being updated), and additional delay caused by OpenTX’s sample averaging. The Frsky X-Lite has an external module bay that is too small to fit standard size JR modules including the TBS Crossfire. Are we giving up that easily? HELL NO! A few people have been taking the X-Lite apart as soon as they received the the first batch, and trying to find out whether they can get it working. It’s important to setup failsafe properly on your mini quad for maximum safety and preventing fly-away. In this tutorial I will explain what failsafe is, and how to set it up in Betaflight as well as on your Taranis TX radio transmitter and receiver.